How to Make Cappuccino Pudding Special Favor. Pudding is a dish that is very known to foreign countries. The taste is delicious and unique shape and taste as though interesting, although only a limited view. Well, because it was the episode this time we will discuss about How to Make Cappuccino Pudding Special Favors . Maybe if you ever enjoy cappuccino pudding, trying to figure out how the heck to make it. pudding dish is also very suitable to enjoy while you're relaxing, or for dessert. Well, cappuccino pudding also has coffee aroma is very fragrant natural that many who want to feel kenikmatanya. Especially in the milk foam in a sprinkle of cocoa powder to make culinary connoisseurs hooked. First, take coconut milk, vanilla powder, gelatin and sugar and put in the pot. Then boiled until boiling. Do not forget to stir, and if that material sugar dissolves. Furthermore, also prepare a cappuccino and instant coffee powder and add to the processed earlier. Stir and process until completely evenly. If so, turn off the heat and stir until no steamy and sports. Then enter and sweet condensed milk into the batter. Terduk until blended. Next, prepare the mold and fill the dough. if it is put in the refrigerator. Wait and let stand until cool and freeze. 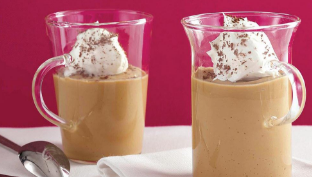 To serve, fill cappucino pudding into a glass, to be your ornament to embellish guakan any pudding dish. Done, cappuccino pudding dish is ready to be enjoyed. 0 Komentar Untuk "How to Make Cappuccino Pudding Special Favor"